Who’s Online! Luddite Links Mini Middle English Tutorial Monna Lisa Nail Paints® It’s DataGame! Pictured: The “Spirit of Dubai” airship (or “dirigible”) on an early Saturday morning on November 18th, 2006, at Fairoaks Airport in Surrey, England, 21.5 miles (34.6 kilometers) southwest of central London. The airship is about to depart at 9:30 a.m. on a whirlwind tour of famous world landmarks—having already visiting several of London’s famous landmarks over the previous week. The “Spirit of Dubai” airship’s tour was to conclude at the chic city of Dubai, in the northeast of the county of the United Arab Emirates, as part of a promotion for a new land development at the time, the “Palm Jumeirah”—built on land reclaimed from the sea, just off-shore in the Persian Gulf, in the southwest of the city of Dubai. If you keep “zooming in” on the Google Map you will see the approximate spot (designated by the colored marker) from where the photographer took the photograph, looking south-southeast from the side of Chertsey Road that borders the north end of Fairoaks Airport. The “Spirit of Dubai” airship is landing about 700 feet (213 meters) in the distance, next to a small-plane taxiway. Chertsey Road is named after the town of Chertsey, just four miles to the northeast of the airport, one of the oldest towns in England. The “Spirit of Dubai,” the world’s largest commercial airship at the time, had been housed in the giant “Hangar No. 1” (the green hanger on the left in this youtube video) at a former Royal Air Force base in Bedford, England, 52.4 miles (84.4 kilometers) north of the Fairoaks Airport, prior to the tour. Here is a website article that describes with words and photos the airship’s 2006 tour. Pictured: A flock of Canadian geese in a “V-formation” heading north to British Columbia for the summer on the Pacific Flyway across the crystal-clear, vibrantly-blue, deep waters of Lake Crescent, on a cool afternoon in April of 2013 in northwest Washington State, in the northwest corner of Washington State’s Olympic National Park, in the Pacific Northwest region of the United States. If you keep “zooming in” on the Google Map you will see the western end of Lake Crescent and the approximate spot (designated by the colored marker) from where the photographer took the photograph, looking east from the south side of the Fairholme Campground. If you look straight ahead, just a little left-of-center in the photo, you can see the peak of the 4,537-feet (1,383-meter) Mount Storm King, at a distance of 8.1 miles (13.09 kilometers) east from where the photograph was taken. Pictured: A sailboat traversing the ever-present southwest winds and warm Gulf Stream currents of the English Channel. The Gulf Stream currents flow northeast across the North Atlantic Ocean into the Celtic Sea, and then into the English Channel. This photo, looking southeast, was taken from Percella Cove beach at the southwest tip of the Cornish Peninsula—the furthest spot southwest on the island of Great Britain, on a sunny day in July of 2010. Percella Cove beach can only be reached at low tide from the main Porthcurno Beach to its right; and, along with Pedn Vounder Beach to its left, the three beaches (known collectively as “Porthcurno Beach”) form a popular tourist destination—as the area is on average warmer than any other place in the United Kingdom. The bird you see in the above animation lands on the Logan Rock (having the same name as the headland), an 80-ton rock that at one time could be easily rocked! Pictured: The South Atlantic Ocean off the northeast coast of Brazil, on the east side of South America, at the historic city of Salvador, on a sunny, 80-degree-plus late afternoon in April of 2008. Salvador is the capital of the state of Bahia, one of 26 states in Brazil. Salvador was the first capital of Brazil back in 1549. These days, the capital of Brazil is Brasília, a futuristically-built, centrally-located city in the sparely populated interior of Brazil. to 'Monumental Axis' Google Map. The photographer took the above photograph from a 14th-floor balcony on the east side of the Pestana Bahia Hotel at the southern tip of the city of Salvador. The hotel is located in the beach neighborhood of Rio Vermelho. The camera is facing south-southeast, and the April winds coming from the east help propel the two sailboats west towards the Brazilian coastline. to 'Porto da Barra Beach' Google Map. Porto da Barra Beach rating article. to 'Salvador Shopping' Google Map. The city of Salvador and its surrounding area are the second most popular tourist destination in Brazil, after Rio de Janeiro. Rio de Janeiro became the capital of Brazil in 1763, replacing Salvador, but was itself eclipsed as capital of Brazil in 1960, by the futuristic Brasília. to 'Rio de Janeiro' Google Map. 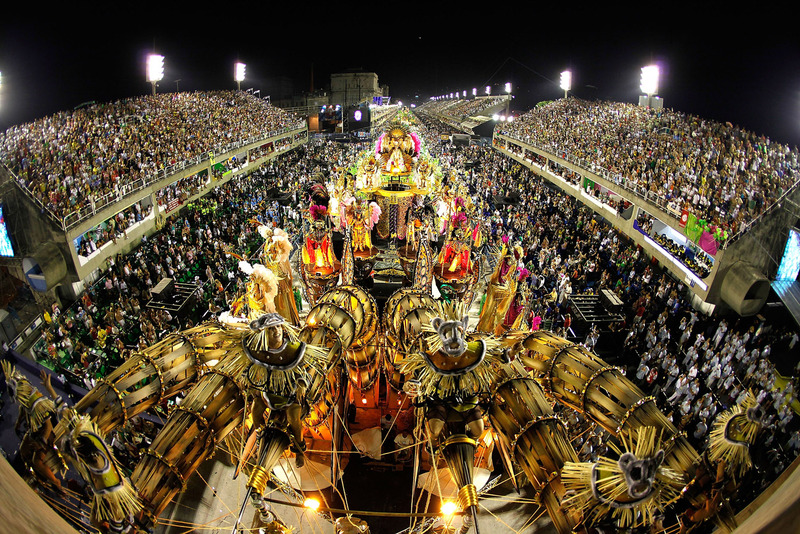 The city of Salvador hosts the Bahian Carnival each year, when about a million people join the three million inhabitants of Salvador for the largest carnival parades in the world, along two main parade routes. In 2017, the carnival will be held from Thursday, February 23rd to Wednesday, March 1st. Above animations are based upon this sitepoint.com article. This web page displays properly in the Firefox 43.0.1 browser. The new SVG/CSS animation on this web page may not display properly—or at all—in some browsers.